GovHK (www.gov.hk) is the one-stop portal of the Hong Kong Special Administrative Region Government with the main content provided by participating Government departments and bureaus, featuring those most sought-after public information and services to make them easier to access and use by members of the public. Ever since the launch of the portal, the OGCIO, in collaboration with government departments and bureaus, has been striving to better the services in various facets of the portal, such as introducing more online services and enriching the content to accommodate different needs of users, and also bringing in multi-media for more vivid content delivery, as well as enhancing the user interface and layout design for more pleasant navigation. In November 2016, GovHK took on a fresh look to make the portal visually more vivid and easier to use. The new design is targeted particularly at mobile device users by introducing enhancements like responsive design and other user-friendly features to enhance the browsing experience of users. To make interaction between citizens and the Government more efficient and effective, in 2010, we launched the account-based, personalised platform MyGovHK (www.gov.hk/en/theme/mygovhk/) on the GovHK portal to provide public services and information tailored to the individual needs of users. 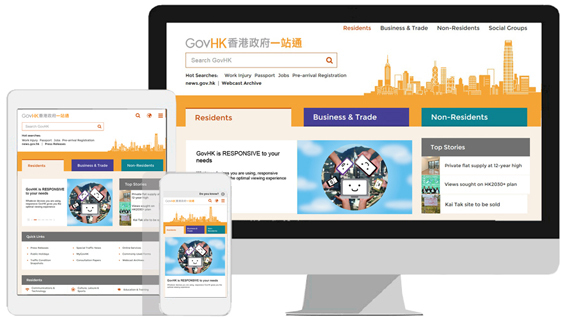 In September 2014, MyGovHK was upgraded with a cleaner look and easier navigation. Equipped with full functions, this new version comes with a simpler yet smarter interface design good for both desktop and mobile view. Mobile device users can now enjoy easy access to government online services anytime, anywhere. My Messages – view messages from different online services and MyGovHK, e.g. messages from Demand for Rates and/or Government Rent and Registration of Outbound Travel Information, etc. To know more about MyGovHK, please view the demo page. 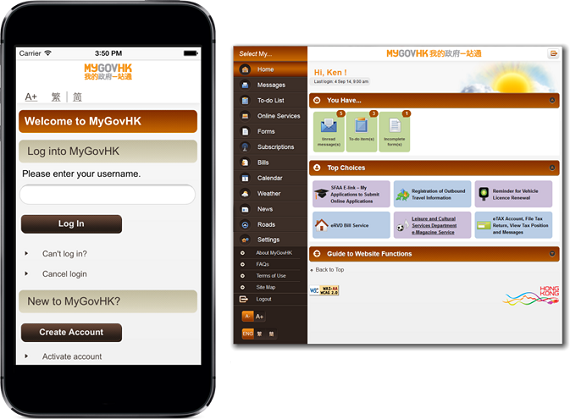 Create your MyGovHK account now to enjoy a variety of features and functions! With MyGovHK as the bedrock for growing personalised government services, the OGCIO will continue to work with government departments to bring in more online services and to launch more new functions for the benefit and convenience of the citizens.